X WHITE Created with Sketch. Icon Scroll Line Created with Sketch. Icon Scroll Arrow Created with Sketch. The Hebrew University of Jerusalem held a memorial service on July 31, 2017, to honor and remember those who were killed and injured 15 years ago in a terrorist attack at the Mount Scopus campus. The ceremony was attended by leadership, students, staff, faculty, and friends of the Hebrew University, at Nancy Reagan Plaza near the site of the attack. 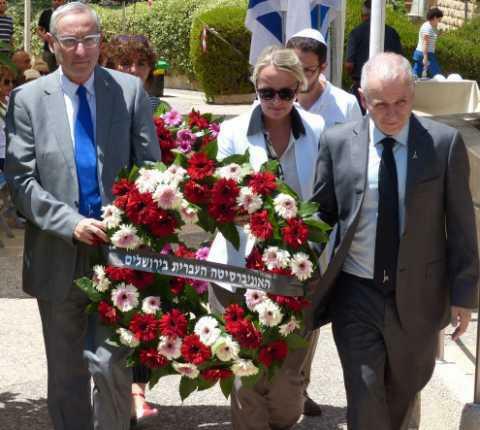 The Hebrew University of Jerusalem held a memorial service on July 31, 2017, to honor and remember those who were killed and injured 15 years ago in a terrorist attack at the Mount Scopus campus. The ceremony was attended by leadership, students, staff, faculty, and friends of the Hebrew University, at Nancy Reagan Plaza near the site of the attack. Among the dignitaries who participated in the event was Ambassador Hélène Le Gal, France’s first female ambassador to Israel, who delivered remarks in Hebrew. You can learn more about the event on the Hebrew University website. Lightbox Increment Created with Sketch. Arrow NEXT-image Created with Sketch.